Pao brothers Hamilton and Fabio are living their childhood dream by representing their country in an international football competition. 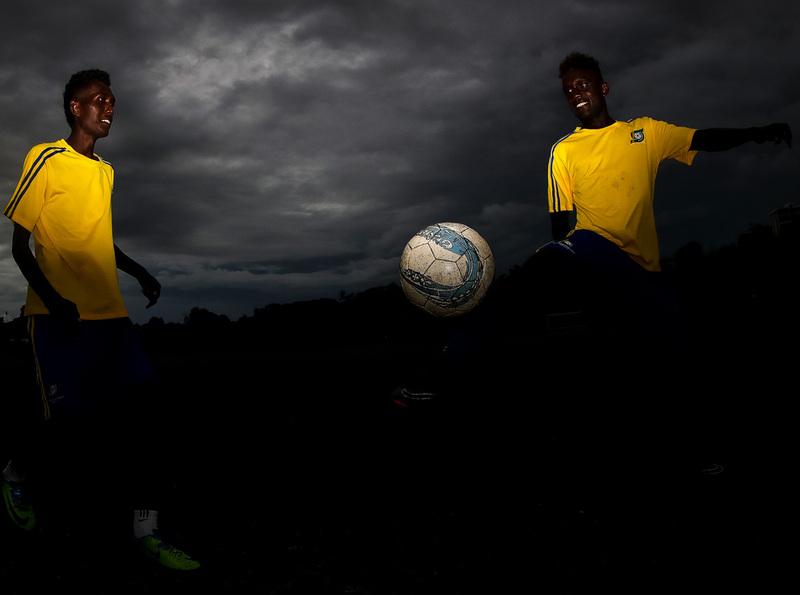 The duo are part of a Solomon Islands U-16 team which has captured imaginations across the nation with three consecutive 5-0 wins in the OFC U-16 Championship group stage against Papua New Guinea, Vanuatu and defending champions New Zealand. Hamilton plays up front while Fabio is a versatile left back, who can also play in the attacking role of a left winger. The boys are cousin brothers from the Western Solomons, originally of Munda. The pair made the ultimate sacrifice for football earlier this year when they left high school in January to be part of the Western U-16 team that went on to win the Youth Solomon Cup in Honiara. Choosing between education and football was one of the toughest decisions they’ve made, especially for the 16-year-old aspiring lawyer Hamilton who also has a burning passion for the beautiful game. The young lad played an instrumental role in Western Turtles U-16 campaign taking his role as captain very seriously, alongside his role as striker in which he scored the majority of goals for the junior Turtles. His fine performances with the Youth Solomon Cup champions caught the eyes of Solomon Islands Football Federation (SIFF) technical director, Felipe Vega-Arango and national U-16 coach Stanley Waita. A called-up into the training squad did not, however, guarantee a place in the national team as more than 50 players were drafted into the first camp. After months of training, he survived the trimming process to make the provisional 30-man squad. When asked why he decided to withdraw from school to join the national U-16 team despite knowing his place wasn’t assured, Hamilton said: “this kind of opportunity does not come twice in life”. “It was a hard decision for me to make since my parents have invested a lot in my education,” he said. “I told them I would return to school next year if they allowed me to take up this once-in-a-lifetime opportunity to represent my country in the sport we all love, soccer,” he continued. Knowing very well what is at stake in Honiara as the Solomon Islands host the OFC U-16 Championship, Hamilton stressed it is his dream to help the country qualify to the World Cup. “My dad told me to make the most of my opportunity in representing my country. It was extra special to be playing in front of my people in Honiara as we all know there are two qualifying spots available in the tournament. “It is my dream to play for my country especially playing at Lawson Tama in front of the home fans. “It will be a dream come true to help my team qualify for the FIFA U-17 World Cup in Peru,” the passionate striker stressed. Although Hamilton didn’t start the first two group matches against Papua New Guinea or New Zealand, he marked his debut against Vanuatu in the best way possible. “My goal against Vanuatu has been the highlight for me so far and I am determined to contribute something in the semi-final if the coach gives me an opportunity,” he enthused. Playing alongside his brother is part of the enjoyment for Fabio. “I am really happy to share the same playing field with Hamilton because whenever we play together it gives us that extra edge to play well,” Fabio said. “We are proud to represent our country, family and community in the Western province. Solomon Islands take on Fiji in the first semi-final tomorrow at Lawson Tama Stadium, where a place at the FIFA U-17 World Cup is at stake.